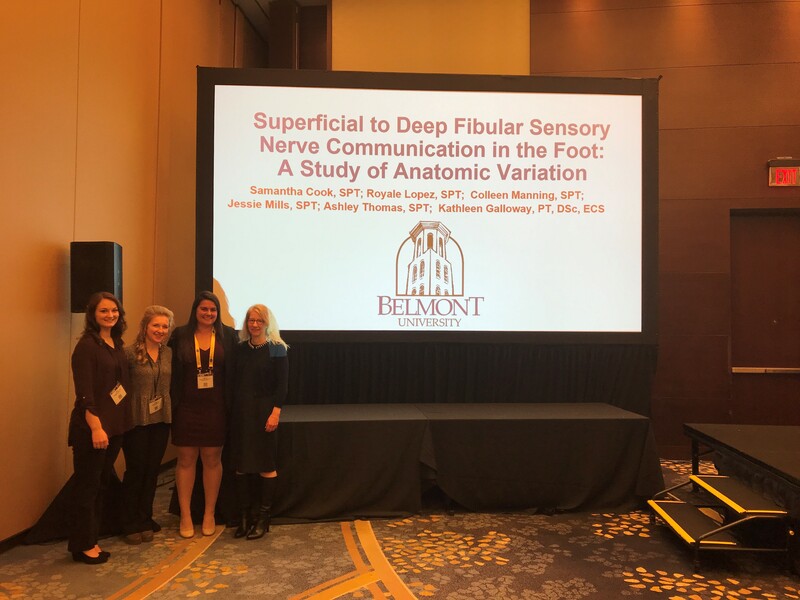 Belmont Physical Therapy student researchers Samantha Cook, Colleen Manning and Jessie Mills presented two papers at the National Physical Therapy Conference in Washington DC on Jan. 26. Their research was conducted at Belmont and included two other student researchers Ashley Thomas and Royale Lopez. The group was mentored by professor Kathleen Galloway. The presentations, “Superficial to deep fibular sensory nerve communication in the foot: a study of anatomic variation” and “Normative values for deep fibular nerve conduction and deep fibular nerve musculoskeletal ultrasound” were enthusiastically received by clinicians in attendance.